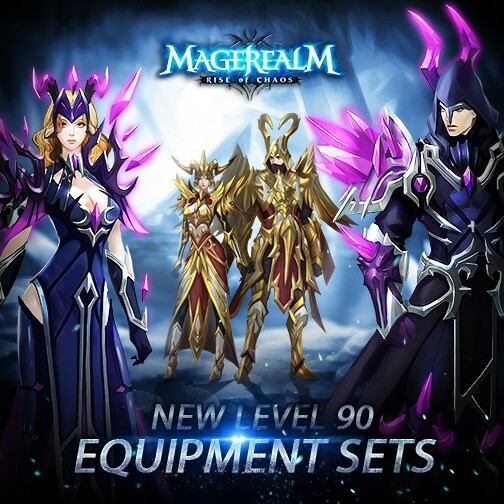 Magerealm, the free to play browser MMORPG from developer GTArcade, has released a new update that introduces two amazing sets of equipment for player characters. Each set provides a stunning new appearance that will have your enemies frozen in awe as you crush them beneath your shiny new boots. The Demonsoul, Runeshard, and Soulshard sets are new high end equipment for the Realmguard, Spellmaster, and Truthkeeper. Scouts from the Mage Council had recently discovered enormous purple crystals protruding from the ground. Rumors say an ancient demon king perished there countless centuries ago. The demon’s unfamothable powers slowly dissipated into the earth over time, and these crystals eventually erupted from the ground. The Mage Council was able to harness a fraction of the crystals’ power and infuse them into new armor for their mages. The Triumph, Destiny, and Glory sets are the other high end equipment for the Realmguard, Spellmaster, and Truthkeeper. Originating from the Heavens themselves, these suits of golden armor were forged by the greatest smiths the Angels have to offer. Each has been made with the finest materials, and then imbued by powerful enchanters to provide unrivaled protection for its wearer. What do you think of the new equipment sets? Let us know on the forums, and follow Magerealm on Facebook and visit the official forums to get the latest news and participate in rewarding events. Come experience an epic fantasy world of magic in this free to play action MMORPG! GTArcade is a leading developer and publisher of free online games. With its guiding principle of “sharing simple joy,” GTArcade has created award-winning MMORPG and strategy games for browser and mobile platforms around the world. Visit www.GTArcade.com today and play all our games for free! Partake in the gaming experience of a lifetime!